Christmas means more Doctor Who! Time to say goodbye to Peter Capaldi, hello and goodbye to David Bradley’s First Doctor, to Pearl Mackie as Bill, and maybe some other familiar faces will show up. Plus, this episode marks the end of the Steven Moffat era! So much to talk about… so we do. We wrap up this season of Doctor Who with a discussion of the finale, notes about Steven Moffat’s bag of tricks, an appreciation of Pearl Mackie and Michelle Gomez, and speculations about where the Christmas Special will take us. So it’s come to this. The penultimate episode of the season. A pre-credits regeneration tease. An enormous spaceship where all is not what it seems. The adventures of Doctor Who, Exposition, and Comic Relief. A surprise inside a surprise. A return to good ol’ Body Horror Cybermen. And a shock ending magnified by its placement at the end of an era, when all bets are off. The Ice Warriors return, as does (somewhat controversial) writer Mark Gatiss, in “Empress of Mars.” This episode felt like classic series “Doctor Who”, and piled on the old-series references too. How did we feel it measured up to this season, and to Gatiss’s previous work? How convenient was it that the TARDIS and Nardole disappeared? And was it a nice respite before we dive into late-season drama? The end of the world is coming. But from where? Is it the obvious choice… or something entirely different? And what are the Doctor and Bill willing to do about it? That’s all part of the intriguing premise of “The Pyramid at the End of the World”, this week’s Doctor Who episode. 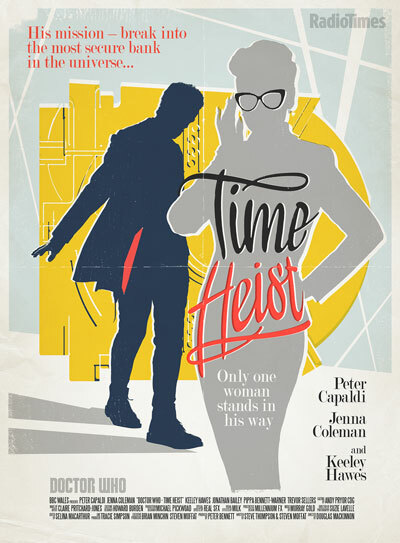 Chip Sudderth of This Week in Time Travel joins Jason to break it down. Space: The final frontier. These are the voyages of The Doctor and Bill, and maybe Nardole. Their mission: to seek out distress calls from strange space stations, and fight the end stage of capitalism before it kills everyone. Live from Seattle, Jason and Glenn discuss “Oxygen” by Jamie Mathieson from a big red couch. A haunted house! A bunch of college students! Alien wood bugs! A parent’s love for a child! This episode had a whole lot of tropes, but to be honest, not much worked for us beyond Bill and The Doctor. If you’re looking to this podcast for a shot of positivity about “Doctor Who” every week, this week you will not be satisfied. On the other hand, if you’d like to hear us complain about “Knock Knock,” you’re in luck! 🙂 The Doctor and Bill just pop out for a moment while the kettle is boiling to explore a future space colony with no people, lots of robots, emojis for communication, and a deadly secret. Did the episode’s scant plot (and abrupt solution) matter, given the strong dialogue and characterization? Grab a cuppa and join Jason and special guest James Thomson as we break the episode down into its constituent parts and use it as fertilizer in a beautiful garden. Doctor Who is back! And we’re here to break down the season premiere, in which we meet Bill Potts, the newest companion. How is her entry into the TARDIS different from other companions? What are the Doctor and Nardole up to? Why should we be afraid of puddles? We break it all down. River Song returns, and this time gets to match wits with Peter Capaldi’s Doctor. Was this one of the most fun episodes of “Doctor Who” in ages, or is that the egg nog talking? In our sixth straight Christmas Night flashcast, we review the 2015 “Doctor Who” Christmas Special. We’re back with the final Doctor Who Flashcast of the season! Everything we’ve been building to for the last 11 weeks has led to this. The Doctor has a bone to pick with the Time Lords. Who is the Hybrid? Familiar diners with familiar waitresses! We flail our arms and get super nerdy as we dissect the finale and the season as a whole with a special half-Scottish panel, if you count Space Glasgow. 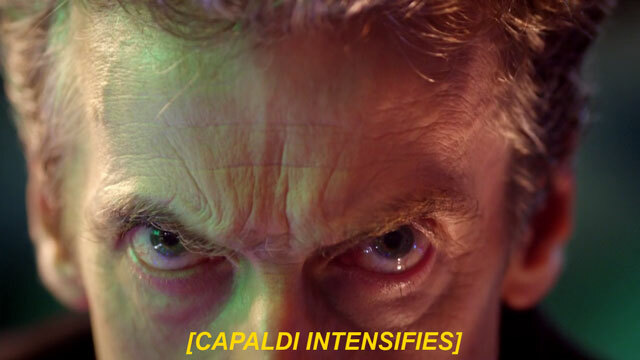 Now it’s the wilderness — 20 whole days until the Christmas special. One night only! Peter Capaldi in the one-man show, “Doctor Who.” We break down part one of the season finale. CHIP. CHIP. WHAT. JUST. HAPPENED. You shouldn’t listen to this podcast. We found this conversation about this week’s “Doctor Who” episode, “Sleep No More,” and present it as it was recorded. Your expectations will be undermined. The plot twists might be shocking. And in the end, you’ll be wondering what happened to the opening theme song. This week’s “Doctor Who” culminates a plot not just from last week, but from the 50th anniversary episode, “Day of the Doctor.” Still, the most important thing in it may be Peter Capaldi’s one-man show, which doubles as a mission statement for The Doctor. And while Clara isn’t in it much, Jenna Coleman does a great turn as her Zygon duplicate. Plus, more Osgood! Last seen in the 50th anniversay special, the Zygons return to duplicate people and invade the earth! Osgood and UNIT return! More sonic sunglasses and electric guitar! Dramatic invasions of Fakeistan and New Mexico! Political parallels aplenty! We break down part one of this two-part episode. Enough TARDIS shenanigans! This episode is all about the Doctor and Clara saving a village of Vikings from an invading hoarde of… space vikings? Plus lots of interesting talk of immortality, identity, and responsibility, and references to Matt Smith and David Tennant. Join us for our breakdown of this episode, which features Maisie Williams from “Game of Thrones” as Ashildr. The Doctor’s a ghost, but how did he get that way? Alien undertakers, deposed tyrants with insidious plans, time paradoxes, and Beethoven! Also, what did the Doctor know and when did he know it? Jason break it all down with the help of James Thomson, direct from Glasgow. An underwater base, a flooded village, an abandoned spaceship, mysterious symbols, and an alien ghost? All in a day’s work for the Doctor and Clara. Join us as we break down “Under the Lake” and look ahead to next week’s “Before the Flood.” Also, did anyone notice that this is all just a big game of Pac-Man? We’re back with a new weekly look at this season of “Doctor Who” with a larger-than-usual panel. Join us as we travel to the farthest Ood-infested regions of space—but watch out for snakes! Look, it’s more trickery from Steven Moffat! Plus, why is Jason both a bad fan and a good fan? And we discuss the nature of two-parters and our expectations going into part two…this is going to be a trend this season, folks. Want only The Incomparable Network’s Doctor Who-themed episodes? Subscribe to this feed or on iTunes. Merry Christmas! If you’ve been bad, someone will put a Dream Crab in your stocking. We break down Peter Capaldi and Nick Frost’s confrontation as The Doctor and Santa Claus. Also, what does this episode mean for Clara? The forest is deep and dark and full of wolves. Join Jason and Glenn to talk about Frank Cottrell-Boyce’s first “Doctor Who” story. If there’s no Lorax, who will speak for the trees? We talk about the Doctor’s relationship to Earth, Clara’s strange decisions about how to protect her young charges, Jason rants about the continued appearances of Missy and how they don’t add up to a story arc, and in the end we give a big fat raspberry to the episode’s final scene. It was quite a roller coaster this week. It’s bigger on the inside, now more than ever! It’s time to talk about “Flatline,” an episode that starts out like it’s going to be funny and ends up being anything but. Will Clara’s lies catch up with her? What does the Doctor really think of Clara playing his role? Does he even want to play it himself? (The answer seems to be yes, if someone else will play the role of the monster.) Listen as Jason breaks it down with his very special guest, his wife Lauren! The Doctor takes a job at Coal Hill School in order to stop a clicky-clacky robot who wants to shoot people full of laser beams. But that’s really beside the point in an episode that’s all about dialogue, character, and the relationships that the Doctor, Clara, and Danny Pink have. We break down the latest episode of “Doctor Who,” “The Caretaker,” and also ponder Matt Smith lookalikes, the Doctor as an officer and a Time Lord, and Courtney Woods, Disruptive Influence. Don’t blink! Don’t breathe! But do listen to this episode, where we break down Steven Moffat’s “Listen,” a standalone episode with some surprising connections to Doctor Who history. We identify a possible theme for this season’s episodes, separate from the story arc. Jason recalls previous Steven Moffat series. And Danny Pink and The Doctor both appreciate the importance of a toy soldier who doesn’t carry a gun. The Doctor finally meets Robin Hood, and refuses to acknowledge his existence! What does this say about the Doctor’s view of himself and his own story? 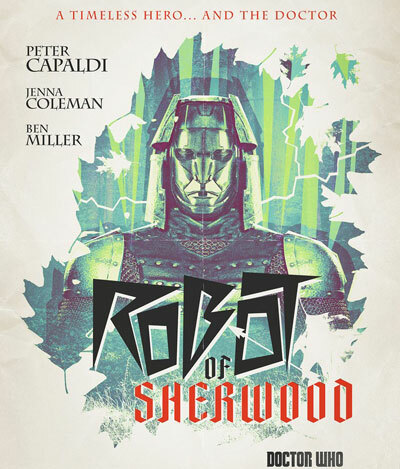 We talk about Mark Gatiss’s “Robot of Sherwood.” Yet another fantastic Capaldi performance with crackling dialogue. Jack Kirby robots! Spoon duels! Gallimaufry! Gold arrows! David Loehr and Dan Moren join Jason Snell to break it all down. Warm up your shrink ray and join us as we journey inside a Dalek! Jason is joined by our very own Glasgow Correspondent, James Thomson, to analyze this week’s Dalek-themed episode. Soldiers named Pink and Blue! Is the Doctor a good man, or a good Dalek? And what did you expect to happen when you “fixed” a good Dalek, anyway? We kick off our weekly look at this season of Doctor Who with a larger-than-usual panel for this larger-than-usual episode. Praise for Peter Capaldi! Condemnation for the clockwork droids plot and the extremely weird skin balloon! We also attempt to define the challenges in regeneration episodes in general, and compare and contrast with some of the most recent representatives.